Peter Gruber was born in 1857 or ’58 in Oil City, PA and as a youngster learned about rattlesnakes from Native Americans who lived in the hills. As a young man he reluctantly entered the restaurant and saloon business with his father where he remained until Oil City was devastated by a flood and subsequent fire on June 5th. 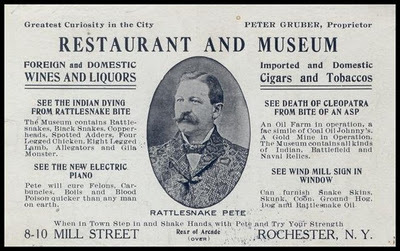 Peter removed himself and along with his reputation for housing poisonous snakes in 1893 went to Pittsburgh, but remained there only a short time when the city officials refused to grant him a business license to operate a saloon in which he kept snakes. 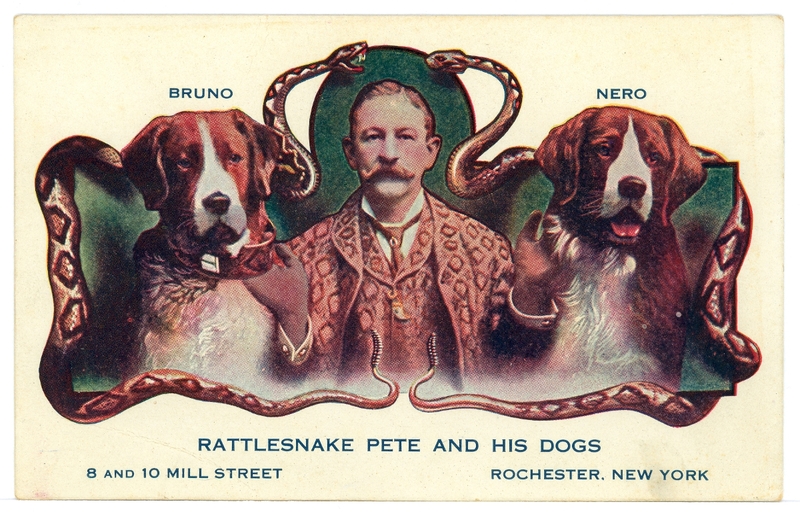 Apparently Rochester, NY wasn’t as particular about housing reptiles as Pete established himself there where he operated his business for some years with his serpent friends, despite being bitten by rattlesnakes 29 times and four times by copperheads. He operated the museum until 1931 and on Oct. 11, 1932 died at his home at the age of 75. He died not from snake bite as one might suspect, but from cardio-renal syndrome complicated by chronic nephritis, chronic endocarditis with lesions of the mitral and aortic valves, and arteriosclerosis. Following a burial mass at St. Mary’s Church he was buried in Holy Sepulcher Cemetery. Eighteen guests were present. The dinner was served in Pete’s den, “an odd little room off his place of business, for Pete, in the hours he can spare from playing with his pets, runs a saloon and restaurant, a quiet pleasant place. Only a favoured few are allowed to pass the door of the sanctum sanctorum where the snakes, sometimes more than a dozen, sometimes several score, live, watched over by their proud owner. The table decorations were striking and appropriate. A big rattler, caged in glass, served as a centerpiece, and stuffed reptiles in various attitudes took the place of the usual sprays of fern and smilax. The foot of the table was presided over by a huge cobra, stuffed of course, and around each plate were two or three diminutive black snakes, all alive. The walls of the room kept their everyday hangings of snake skins, rattlers’ rattles, canes made from wrigglers’ skins and many other curios.” Pete’s coat made entirely of rattlesnake skins was probably displayed there as well. Some guests compared the stew to fish chowder, frogs’ legs, or eel, but when asked for the recipe the host refrained from offering it. The rattlesnake was thought similar to chicken or veal, but most guests claimed their hunger quite satiated before the python with egg sauce and roast boa constrictor were served. The guest of honor took the caged rattler from its glass-walled den, wrapped it about himself quite playfully, and discussed the habits of the rattlesnake with his fellow guests who did not share his enthusiasm. When one of the attendees doubted the snake was capable of inflicting harm, the gentleman pried its jaws apart with a pen-knife whereupon drops of venom dripped from its fangs onto the knife blade. Source: The Strand Magazine. Nov. 1901. Various issues of the “Rochester Democrat and Chronicle”. Stilson, Charles B. “The Biography of Rattlesnake Pete”. 1923. Postcard images. For going on 20 years now, the Heritage Foundation and the Wall Street Journal have been putting together an annual Index of Economic Freedom by evaluating countries the world over based on ten criteria along the lines of property rights, government spending, freedom from corruption, trade freedom, and the like. They released the 2014 edition of their annaul Index today, and here’s the good news: Worldwide economic freedom has reached record levels, huzzah! The various governments of 114 countries took steps in 2013 that increased their citizens’ economic freedom, and 43 countries all over the world have now reached their highest ranking in the Index’s history. Awesome, right? But, here’s the bad news: The United States is no longer among the relative elite of these economically free nations. Oof. 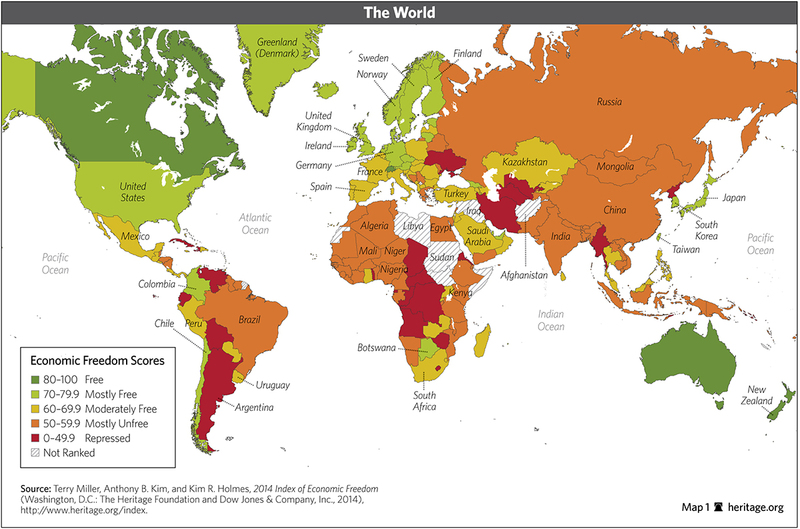 Countries achieving higher levels of economic freedom consistently and measurably outperform others in economic growth, long-term prosperity and social progress. Botswana, for example, has made gains through low tax rates and political stability. Those losing freedom, on the other hand, risk economic stagnation, high unemployment and deteriorating social conditions. For instance, heavy-handed government intervention in Brazil’s economy continues to limit mobility and fuel a sense of injustice. It’s not hard to see why the U.S. is losing ground. Even marginal tax rates exceeding 43% cannot finance runaway government spending, which has caused the national debt to skyrocket. The Obama administration continues to shackle entire sectors of the economy with regulation, including health care, finance and energy. The intervention impedes both personal freedom and national prosperity. Hong Kong, Singapore, Australia, Switzerland, New Zealand, Canada, Chile, Mauritius, Ireland, Denmark, and Estonia all outrank our new 12th-place spot, with Venezuela, Zimbabwe, Cuba, and North Korea bringing up the very rear […shudders]. We enjoy shopping in antique stores and enjoy the search for special pieces. Periodically we will take notice of an item that we may not have paid any particular attention to before, but once we do then we seem to see the item everywhere we shop. 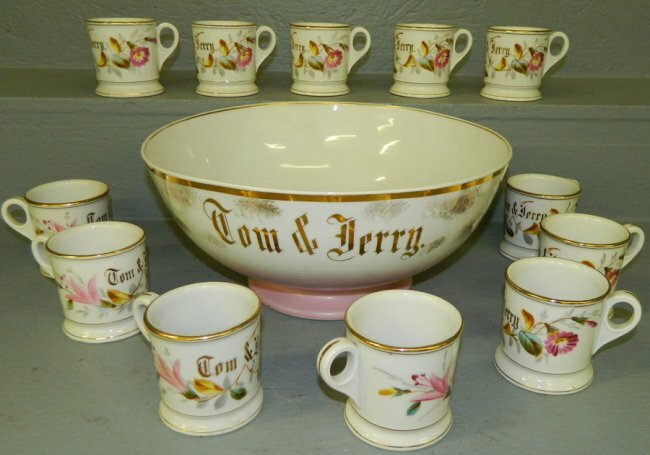 Tom and Jerry punch bowls and cups are one of those items. The drink has nothing to do with the cartoon characters some of us grew up watching. It is doubtful the drink was created by bartender Jerry Thomas who wrote “How to Mix Drinks” in 1862 despite several articles and online accounts crediting him with the drink’s origins. 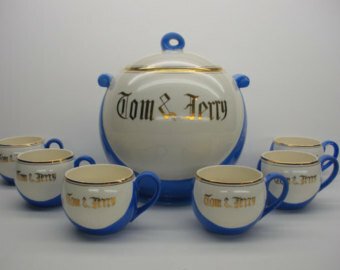 Although he made them often and the drink became associated with him, references to Tom and Jerry predate Jerry Thomas’s book by four decades. The phrase dates from 1821 when “Life in London; Or, The Day and Night Scenes of Jerry Hawthorn Esq. and his Elegant Friend Corinthian Tom” was released, written by Pierce Egan and dedicated to George IV. It seems to have been made and served since the release of the book. In fact, some claim Egan introduced the drink, which is a form of eggnog, and called it a Tom and Jerry to draw attention to his book and subsequent play with characters by the same name. The play was titled “Tom and Jerry, Or Life in London” and it also premiered in 1821. Various slang dictionaries define “Tom-and-Jerry Days” as the period of the Regency (1810-20) when George IV was king, and a Tom and Jerry shop was a low drinking establishment. – Henley, William Ernest. Slang and its Analogues Past and Present. 1904. One hasn’t far to look to find references indicating that the term was not something well-bred people aspired to. The great increase of crime was attributed to a large degree to the beer-shops which were, “significantly termed by the lower classes ‘Tom and Jerry shops’”. Nineteenth century books reference Tom and Jerry Clubs, Tom and Jerry amusements, Tom and Jerry sprees, and there’s the ultimate phrase, “spend their evenings in riotous debauchery, drinking, gambling, and raising Tom and Jerry”. – Bather, Edward. “Thoughts on the Demand for Separation of Church and State”. 1834. London. & Dow, Jr. “Short Patent Sermons”. 1841. NY. In later decades a Tom and Jerry became associated with Christmas and cold weather, defined by some as the period extending from Thanksgiving to Christmas. “5 lbs. sugar; 12 eggs; ½ small glass of Jamaica rum; 1 ½ teaspoonful of ground cinnamon; ½ same of cloves; ½ same of allspice. Beat the whites of the eggs to a stiff froth, and the yolks until they are as thin as water, then mix together and add the spice and rum, thicken with sugar until the mixture attains the consistence of a light batter. Take a small bar glass, and to one table-spoonful of the above mixture, add one wine-glass of brandy, and fill the glass with boiling water, grate a little nutmeg on top. TOM AND JERRY MIXTURE. Take the whites of any quantity of eggs and beat to a stiff froth. Add one heaping tablespoonful of fine sugar for each egg. Beat the yolks of the eggs separately; mix together, adding a pinch of bicarbonate of soda, and beat to a stiff batter. 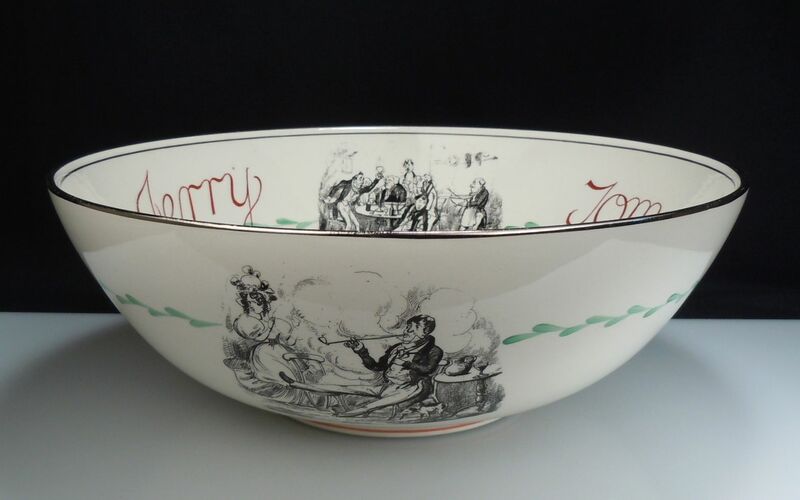 Stir frequently so as to prevent the sugar from settling in the bottom of Tom and Jerry bowl. HOW TO SERVE TOM AND JERRY. 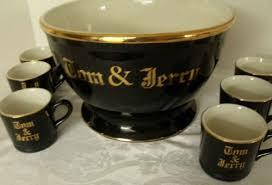 Put two tablespoonfuls of the above mixture into a Tom and Jerry mug; add half a jigger brandy and half a jigger rum, fill with boiling hot water or hot milk; mix well with a spoon, grate nutmeg on top and serve. TOM AND JERRY COLD. Serve same as above, using cold water or milk in place of hot. – Kappeler, George J. Modern American Drinks. 1900. Akron, Ohio. Option: Some recipes said to add a stick of butter and/or mix with hot milk instead of hot water. I received a book about Queen Victoria’s staff, “Serving Victoria: Life in the Royal Household”, by Kate Hubbard, for Christmas and as a huge Downton Abbey fan I am enjoying it very much. I can relate with Ms. Pattmore, the Downton cook, as she struggles with new technology in a world that is changing from the old order she’s familiar with to one of new-fangled electric lights, telephones, and even an electric mixer! I find changes in technology (like learning Windows 8) just as stressful and off-putting. I’m quite experienced in food preparation when the open hearth or wood stove were standard and I can sympathize with her plight of desperately holding on to the job that is absolutely essential to her well-being while decades-old methods she’s expert in are being replaced at a frightening pace. I am more at home in my kitchen – in any century – than in trying to figure out new software and keep up with much younger co-workers. Daisy, Ms. Pattmore’s underling, readily accepts the new gadgets and seems born with an understanding of how to use them, while Ms. Pattmore is charming but clueless. The program does a remarkable job at providing insight into the daily lives of a large staff and the struggles of one kind or another that face them all. Daisy, for instance can immediately grasp the use of the electric mixer, but is just as clueless when it comes to romance and understanding the young men on staff and how they interact with her and a prettier and more-worldly fellow staff member. In closing, I’d like to share this paragraph from my book as some of my readers may also enjoy the program and find comparing the fictional staff to the real world staff of Queen Victoria intriguing. “She marveled at the below-stairs world, glimpsed whilst accompanying Her Serene Highness of Oldenburg on an inspection of the ‘plate’, including the kitchen with 24 cooks and 17 pieces of meat roasting and the confectionary, a very world of jellies and jams. Besides the kitchen with its two great open fires, and a huge steel table with hollow brass legs, steam-heated to keep food warm, there was a green room (for preparing vegetables), a confectionary and a pastry kitchen. The twenty-four cooks included a head chef, three master cooks, two yeomen of the kitchen, two roasting cooks, four apprentices, two larderers and storers, a storekeeper, two green office men, three kitchen maids and two men to supervise the steam apparatus, while the confectionary boasted first and second yeomen confectioners and three female assistants”.